website and graphic services. With over 20 years of design experience but with a ‘down to earth’ approach. 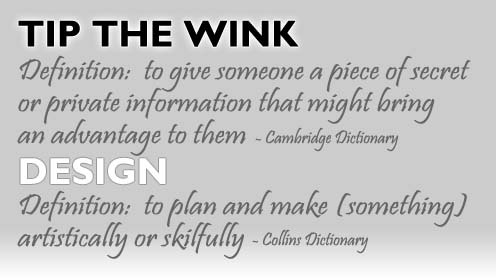 Tip the Wink Design offer a friendly service, explained in plain English, to ensure the most appropriate presentation and economical methods are used. Whether to use a custom design or an ‘off the peg’ template, Tip the Wink Design helpfully highlight a selection of options best suited for your service requirements and ambitions. Thank you so much. You have been very helpful. Thank you for making the changes, it looks really great. Yes, that’s great, excellent... Hooray! Get the champers out! is just what I imagined. I am very pleased with the result!!!!!!! the website / logos /etc, that we had such large number attend the event. You have certainly created something which we all feel very proud of.